Terrific Ice Cream Toppings: Going Boldly Beyond the Sprinkles! We hope your freezer is overflowing with frozen fantastic-ness, and your ice cream bowl never empty. We also hope you’re keeping your ice cream as cool as it is cold by experimenting with toppings new and old. Need a little inspiration? We think we might have some extra lying around! We don’t have any issue whatsoever with typical ice cream toppings, whether you pile on the peanuts or go a little crazy with chocolate sauce. But we do like to mix things up from time to time, foregoing ice cream topping classics for something unexpected and a bit more adventurous. Here’s a few of our favorites – and please share yours in the comments! Boston Baked Beans – Simply can’t skip the peanuts, but are open to a new take on them? Grab yourself a box of Boston Baked Beans! Those candy coated peanuts we all know and love taste terrific atop a scoop of vanilla, chocolate, mint chocolate chip or coffee ice cream. We’re certain they taste good with other flavors as well, but if we did all the research that wouldn’t be very fair to all of you! Raspberry Gummy Pretzels – Not only are these fruity cuties tasty on their own, but they add an extra ‘dash o’ summer’ to any frozen treat they top. We tried them on rainbow sherbet, caramel ice cream, and vanilla frozen yogurt. And if our trials were the SATs, each of those combos would be primed for a seriously good scholarship to Yum University! Candy that Calls on Summer Classics for Inspiration! They say that imitation is the sincerest form of flattery, but sincerity was never so sweet as it is in the following collection of candy copycats! Each of these perfect-for-summer treats takes a cue from another summer treat that came before it, and we think there’s more than enough room in our lives for both. Marpo Marshmallow Ice Cream Cones: If we told our team in the candy warehouse that they had to safely ship out a tub with 30 real ice cream cones inside, I think we’d have a mutiny on our hands! 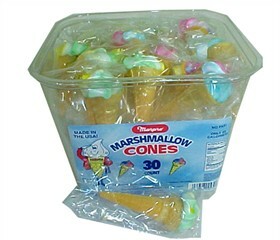 But when those 30 cones are of the marshmallow variety, our team is happy to pack them up and send ‘em your way every day. 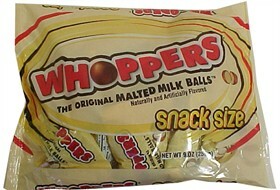 These are an all-around fun treat for any season, but especially make a splash in the summer. Necco Banana Split Candy Chews: Unlike the marshmallow ice cream cones above, these petite sweets don’t resemble a banana split in shape, but they do pack plenty of banana split flavor. With 240 to a tub, there’s more than enough to share, and you don’t have to worry about dropping your banana boat! Icee Squeeze Candy: Ever get a craving for an Icee while you’re camping and they’re miles away, or it’s 2 in the morning and you don’t want to swap your slippers for real shoes? We’ve all been there. Icees are pretty much summer royalty, foregoing their crown for a straw with a little scoop on the end! 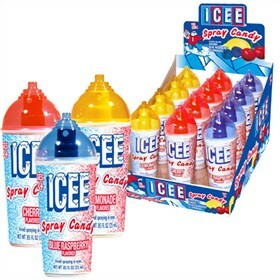 But the brains at Icee headquarters have thankfully avoided brain freeze long enough to bring us something genius – Icee Squeeze Candy, Icee Spray Candy and Icee Gummy Candy, all perfectly portable ways to enjoy Icee awesomeness anywhere, any hour, anytime!